Also - Browse G/GT/GTX Turbo Upgrades Here! 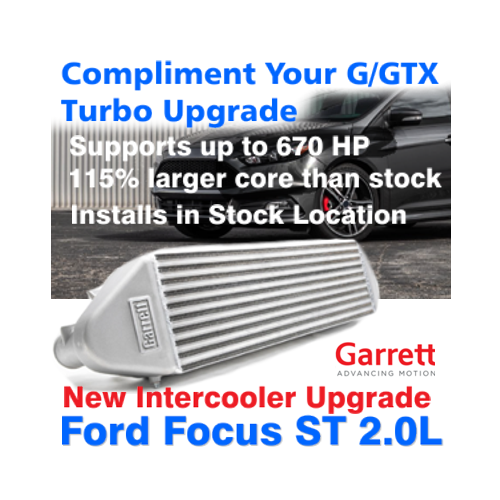 The Garrett® direct fit Ford Focus ST performance charge air cooler boasts a 115% larger core that helps reduce intake manifold temperatures by an average of 11 ℉ (6.1 ℃) based on OBD II data. Optimized end tanks improve air flow through the core. This performance intercooler showed an increase of up to 25 HP (19 kW) and 9 lb-ft (12 N-m) of torque compared to OE during back to back dyno comparisons in a wind tunnel which generates air velocity that matches vehicle speed. During testing the heat saturation point increased from 4 dyno pulls to 8 dyno pulls.